From L.A. to Arizona, and many places in beyond, flight paramedic Andrew Merrill has experienced a lot. Here, he shares just a bit about how simulation training fits into his professional life. Andrew Merrill FP-C (Flight Paramedic/Certified, Clinical Base Educator and Project Leader for HPS Scenario Development at Air Methods in Arizona), began his career in emergency medical services in 1995. He worked as an Explorer for the Los Angeles County Fire Department and cut his teeth on varying levels of safety protocols, hands-on development training, and the basics of emergency services coordination. But it didn't take long for the young EMS professional to see himself doing something more, on a grander and higher scale. "After working as an EMS, I became an EMT in 1998 and worked for an ambulance company in Inglewood, California," says Merrill. "In 2004, I became a paramedic, and started flying for Air Methods in 2008." Air Methods, a global leader in air medical transportation, is headquartered in Englewood, Colorado. Since its founding in 1980 by Roy Morgan, the company has directly transported more than two and a half million critically injured patients --either from the scene of an accident, or from a general care facility -- to highly skilled trauma centers or tertiary care centers around the country, for additionally necessary medical attention. Focused on providing quality air medical transport and patient care, Air Methods has grown into one of the most widely recognized and "experienced air medical operators in the industry." Andrew Merrill was kind enough to discuss his experiences with simulation-based education and emergency care training. How did you become familiar with simulation training? We started using [CAE Healthcare] simulation products to enhance our training for airway, ventilation, skill building, and introducing new standards of care. We also were approved through CAMTS (the Commission on Accreditation of Medical Transport Systems) to use simulation in lieu of annual clinical time for our clinicians." Which simulators do you have and use, specifically? "In my region (Arizona and New Mexico) we currently have 3 METIman simulators, 2 pediatric sims, 2 infants and one Lucina female simulator. Our education classes, especially the HPS lab, involve every aspect of clinical care. So we use all the sims on a regular basis -- for new hire training/end of orientation check off, annual classes, scenario testing and some outreach classes." How do CAE Healthcare simulators support your EMS training initiative and needs? "Having the sims available to us during a new hire (orientation) is ideal. We can put the nurses through pre-hospital scenarios and get them adjusted to being a first responder. We can also put the paramedics in hospital roles, leading them to becoming more comfortable in an ICU setting. Also, we can update our HPS training as needed to help with clinical performance." The benefit of simulation-based training has been well documented. 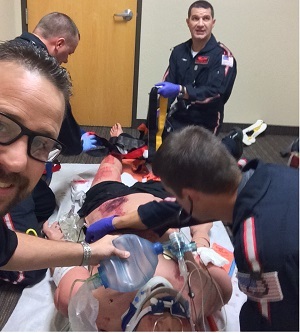 For EMTs, paramedics, and other clinical professionals within pre-hospital settings, immersive educational simulation helps with skills improvement, facilitates communication and strengthens decision making. In the end, all of this works to benefit patient safety. Simulation provides an environment in which learners can successfully comprehend and master clinical skills without undue risk to learners, staff members or patients. Simulation permits errors to occur, develop, and follow through to their natural conclusion. Its advantages include decreased patient risk, ensuring that learning outcomes are addressed; enabling deliberate practice, and immersion in learning tasks. Realistic, high-fidelity simulation is both applicable and relevant to pre-hospital practitioners, like air medical transport personnel. Or, in the words of Andrew Merrill, medical simulation-based training "helps to build confidence in a world where clinical excellence is paramount."